For this month session he invited Photek (picture above), the legendary avant-garde Drum and Bass producer who composed with his jazz-influenced, highly complex drum patterns and sequenced double bass lines some scuffproof cornerstones of the Drum and Bass culture. This Wednesday the man from Los Angeles will play his first UK/Europe gig of 2011 and introduces some of his new productions that taking him into another sound direction. Alongside Photek will be the 25 year old DJ and producer Wbeeza, who is momentarily Europe-wide celebrated for his audacious, deeply soulful House and Techno productions. 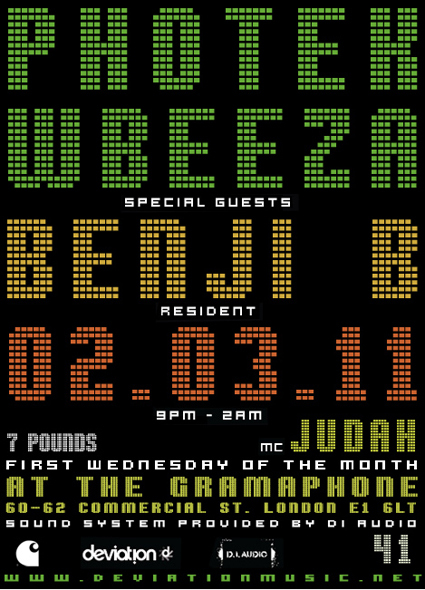 As a matter of course resident DJ Benji B will holding down the decks for the rest of the session with host MC Judah.